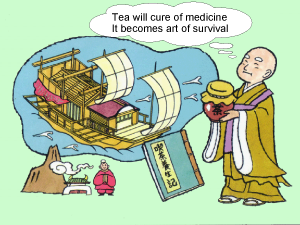 When the monk Eisai brought tea back from China, he also brought back a chronicle outlining the virtues of tea as a medicine, which he presented to the shogun Sanetomo. The virtues listed in the Chinese document have recently come to be proven scientifically. 1.Tea contains lots of Vitamin E which is helpful in preventing aging. 2. Tea catechin helps prevent cancer. 3. Catechin has antimicrobial properties which help prevent food poisoning. 4. Tea contains catechin and vitamin C, both helpful in preventing colds and flu. 5. Catechin lowers your cholesterol. 6. Catechin helps regulate blood sugars. 7. Catechin helps regulate blood pressure. 8. Catechin helps keep allergies in check. 9. Tea contains saponin, which boosts virility, inhibits fat production, strengthens the heart. 10.Tea contains vitamin A, C, and E, making it good for the skin and beauty maintenance. 11. Tea is helpful in dieting because of the fat burning effects of caffeine, as well as the fat breakdown effects of catechin. 12.The caffeine and vitamin C in tea helps replenish glucose in the blood, alleviating hangovers. 13. Caffeine helps alleviate stress and fatigue. 14. Flouride helps prevent cavities and bad breath. 15. Fiber helps promote regularity. 7 – 10 cups a day (using a large size tea cup). Eating the tea leaves directly will be even more effective. Brew the tea relatively strong. The first and second brewings will contain most of the desirable tea compounds. Used tea leaves can be added to foods to get all of the tea’s benefit. The important thing is to continue to take every day. -Use with ponzu or dressing in marinated foods. -Try with natto in place of onions. -Mix with jakko fish and bonito flakes, add soy sauce and mirin, then use as a topping. -If you put the tea leaves in a tea bag or gauze and add it to the pot when boiling fish, the fishy smell will be removed. -Using the juice from used tea leaves in the preparation of fish will remove smells and have an antiseptic effect. -Place in the bathtub in a gauze bag to get soft smooth skin. -Use in cleaning the kitchen for disinfection and elimination of bad smells. -Sprinkling dried spent tea leaves on the floor before sweeping will give you a shiny floor. -Place dried spent tea leaves in the corners of the room or the refrigerator to eliminate bad smells.